This walk: 2015-9-2. Tolchmoor Gate, holed stone, Crownhill Tor, Lee Moor China Clay Works, Ridding Down, lowland heath, Drakelands Tungsten Mine, snake skin, Broomage Farm. Previous walks in this area: 17th June 2009 (with 800 x 600 pixel-sized photographs), 28th July 2010 & 14th March 2012. View through the hole, from behind, so to speak, in the photograph above. Tolchmoor Gate car park: the holed stone can just be seen behind a large rock on the right edge in this photograph. What appears to be a large inspection hatch or manhole cover on the disused china clay slurry pipe from Lee Moor to Coypool (Marsh Mills, Plympton). The old works can be seen on the Google map (linked above and HERE) - about twice as far as the north-south "length" of this walk down to the south-west: the works ceased operations in 2008. A view to Plymouth Sound. ????? This wasn't Whitehill Tor, was it! Crownhill Tor, SX 5769 6090, elevation 233 metres (764 feet). From the same location as the above photograph, turning around to see Lee Moor village with china clay waste behind ..... clay working started here in 1830 on land leased from Lord Morley. 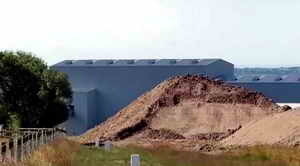 Thick clay slurry used to travel five miles by gravity in a pipe down to Marsh Mills to a processing and drying works. Ridding Down, behind is an area of quite rare lowland heath - some of which will be covered by waste from the new Drakelands (Hemerdon) Tungsten (and tin) Mine. In 1842 the area was described as Reddown Waste, relatively undisturbed as not being part of the clay works. Also known as Crownhill Down, it has Bronze Age barrows, excavated recently to reveal Beaker pottery and stone tools dated to 2200 BC. Also, bronze axe heads dated to 1300 BC. Some cairns are thought to delineate medieval tin workings and field clearance stones. Zoomed view ..... Tin mining (streaming) has been here since medieval times. Lowland heath of Crownhill Down: with Bronze Age and Tungsten Age artefacts. Part of Drakelands Tungsten Mine - the first metal mine in Britain for over forty years. Tungsten was first found here in 1867. Processing started in 2015. Wolf Minerals (Australia) purchased mineral rights in 2007. The whole site is 240 hectares (600 acres), with 175 hectares (430 acres) designated for waste. Currently approved to go down to 200 metres, but deposits go down to 400 metres. It emplots 250 and produces 2500 tons of waste for each ton of metal. Zoomed view ..... Tungsten was first discovered here in 1867: this mine has the world's fourth largest deposits. Another view of the tungsten works. Zoomed view to Plymouth Sound: the storage tanks (approx. in the centre) are the petrol tanks at Cattedown and the inland water to the right is looking down the estuary of the River Plym - the far bank being Embankment Road into the city centre and the trees to the left being in Saltram. Another view, with the chimney at Derriford approximately in the centre. Four-way fence at the southern extremity of our walk. Zoomed view into the mining works. Betwixt and between tungsten and clay works - the tungsten mine is to develop further left with the loss of the clump of trees. Possibly an early clay settling pond? There is an old pipe leading towards it. An ancient china clay waste tip. Soil profile, 0.5 metres deep, in the bank of the eroded track: clay on peat? Who spotted this, miles away on the eastern skyline. Broken clay pipe from Shaugh Lake works. China clay leak from the old pipe. The tungsten mine seen from the road to Plympton. Panorama of the new Hemerdon mining site. 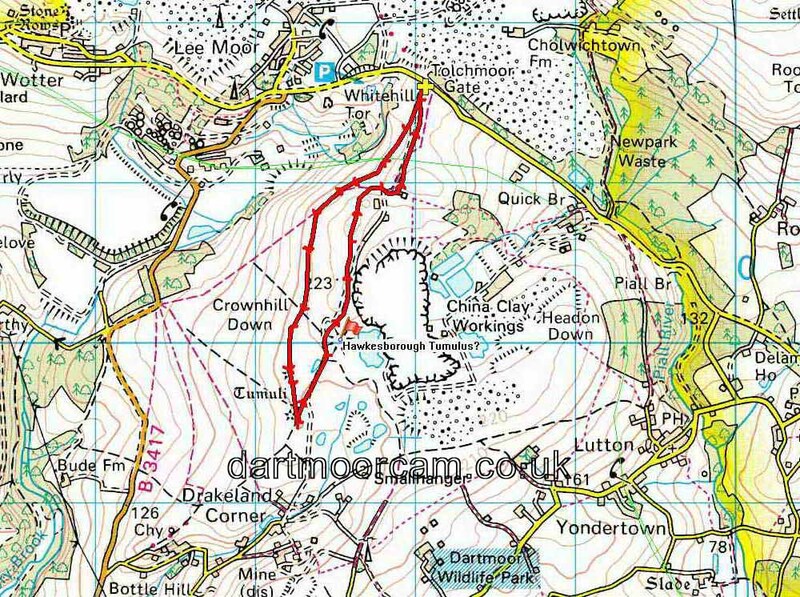 This walk was reached via Beatland Corner (south of Cadover Bridge) and driving through Wotter, towards Cornwood, passing the entrance road to Lee Moor village, up the hill, and partly around a bend to the right, where there is parking on both sides of the road, indicated by the yellow cross on the map. Distance - 5.00 km / 3.11 miles.